As the financial grip gets even tighter on our pockets, we thought it best to bring you some more cheap beats to help you spend your pennies NOT pounds whilst out diggin'. Here at DAILY DIGGERS headquarters we're always banging on about how the best breaks come cheap, and hopefully we will continue to lead you the right way whilst you are out digging in the field (as opposed to digging in a field - for gardening advice try HERE instead). Ahem ... anyway let's go deep into DYNO's dusty racks and fish out a few bargain breaks. We give you more beats for your Buck, more percussion for your Pound, and more eurythmics for your Euro. It doesn't take long for me to haul out some cheapo beats and breaks, plus it's always nice to find a record or two that I forgot I owned! And very often I can listen to an LP years after buying it and find a sample or nice loop that I had not spotted before. It's always worth a second listen I say. This gatefold double LP is full of great samples and sounds for the beatmakers, plus there are some pretty laidback funky tracks, including this one as used by HARRY LOVE from the UK if I remember correctly. The harp in this track is absolutely beautiful, and the bass and drums very provocative particularly in the intro section. A real downtempo joint, but with that headnod factor to keep you snapping your neck. It becomes to pulse almost, and then is accompanied by Spanish guitar riffs riding on top just as the groove becomes constant. Not a long recording by any means, but as funky as you could wish for. This was the first time guitarist John Williams had worked with Beatles producer George Martin. Latin is not my strong point whatsoever, but this cheap UK release on CONTOUR has some very nice tracks, and is crammed full of drum beats ripe for the taking. 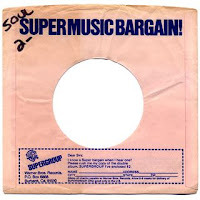 Plus it's an easy LP to find and will not cost you more than a couple of pounds. I say grab it when you see it. 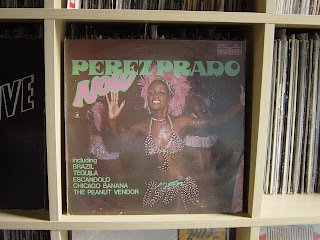 I can't possibly rip all the tracks, but I've added links to 2 of my favourites below, most notably "Que Es Lo Que Pasa?" which I have dropped before on BREAKS FOR DAYS radio. Senor Prado was born in the Cuban town of Matanzas, and grew up in music there and eventually joined Cuba's top orchestra - the Orquesta Casino de le Playa. He moved to Mexico in 1948 to develop his mambo ideas, which swept the world to the extent that he became known as "El Rey del Mambo" - King of the Mambo - with compositions such as Mambo Jambo and Mambo #5 to his credit. PEREZ PRADO - Que Es Lo Que Pasa? STAN KENTON - "Hair" LP on CAPITOL RECORDS 197? Any beat digger worth his salt, knows that most LPs with music from the show HAIR are worth a listen. But it is always the same LPs that show up time after time. This LP however is a little more elusive, but by far the best when it comes to breaks. The version of "Colored Spade" on this LP is incredible, with drummer extraordinaire PAUL HUMPHREY providing some of the illest b-boy drums I have heard. I have lost count of how many LPs where I check the back cover credits and find PAUL HUMPHREY on drums - now that makes for a guaranteed purchase. And this LP was no different, but it still surprised me how funky this version of HAIR was. And the drums tempt me to toprock out my skin! And I'm no b-boy! Listen for yourselves, then rush out a bag yourself a copy. I'm sure you will remember the babe on the cover smoking her pink cigarettes - man that's what I call chain smoking! Hopefully one of this little selection of LPs will pop up next time you're getting your fingers dusty at the boot sale or charity spot, and now you will know to grab it with both hands! Now tell me ... who brings you the best beats? WICKED JOHN WILLIAMS CLIP dynO, HARYY LOVE DID INDEED USE IT ON THE JEHST TRACK "ALCOHOLIC AUTHOR". what about a paul humphrey special? I am afraid I know anything about him so far? Is he like the UK Steve Gadd? reminds me of a break i copped for a few hundred pennies at the same time as that Detective LP in the corner of the bottom two photos, it's called Sometimes Loving You, by The Don Harrison Band...one few the next Breaks For Days radio show perhaps?? 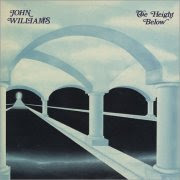 that john williams album is under rated i also dig the stanley myers side is exquisite also. Hey, Dyno did u get the email? God I love the start of that Stan Kenton 'Colored Spade' first time ive heard that one its got some gruesome funky drums..
just scored the Stan Kenton,along with 7.5 on the Richter Scale, Stan Kenton plays Chicago, Nelson Riddle- Communications on MPS and the tough George Shearing on MPS The Way We Are. SO...the moral of the story is they are still out there for cheap if you take time to hunt...that lot cost me six quid total. the records are STILL OUT THERE! I haven't had a diggin' session in Kent for a while now, we used to find some bits outta Tonbridge and Sevenoaks. Is it any good now Gav? ?